Fourth entry in the 3 Fantastic Supermen series. This one is an Italian-Hong Kong co-production and is a combination of gladiators and Chinese swordsmen. 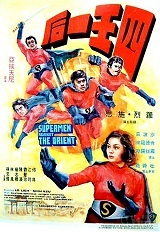 Features some stunts performed by Jackie Chan. Starring Robert Malcolm, Antonio Cantafora, Sal Borgese, Alberto Farnese and others.